On the face of it the Corsair HX 650W is particularly suited to standard desktop systems and casual gaming machines. It provides power to a range of system components that include PCI-E and SATA devices. It comes with a robust single 12 volt rail is 80Plus Bronze certified, Nvidia SLI compliant, and is semi-modular. Under our tests, the Corsair HX 650W achieved 100 per cent of the manufacturer's claimed performance based on real-world scenarios involving the most commonly used 12 volt rails. Looking at total efficiency, the Corsair HX 650W came in around the mid-range mark for its class, lagging behind other power supplies such as the Antec TruePower 550W but still ahead of others like the Spire Blackmoon 650W. It did gain substantial ground in terms of standby efficiency; achieving second place from a field of seven similar power supplies. This PSU produced a fraction more decibel noise when compared to most other PSUs in its class like the OCZ StealthXStream 2 600W and the Xigmatek NRPPC602 600W, although the overall noise difference was minor. Thankfully, the tiny bit of extra noise was justified because the 120mm fan performed well to vent heat, helping to keep the PC cooler on the inside than it was at the exhaust, and the cables did not significantly heat up during high loads. The tested rails were all within the ATX specified tolerances, comfortably meeting the standard. Importantly the Corsair HX 650W did not suffer from high electrical interference, in fact it produced an almost jitter free voltage noise reading at the 75 per cent load level, translating to a near flat line on the corresponding oscilloscope printout. 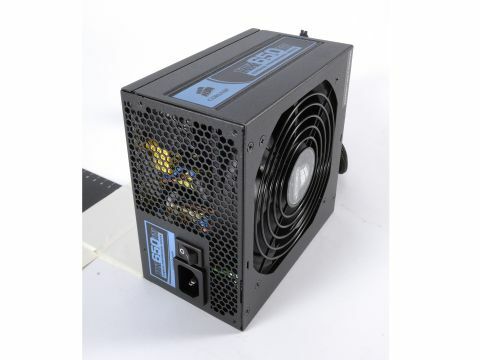 Despite the price, the PSU has a mostly plain-black casing, complimented by a somewhat dull powdered blue logo and the standard honeycomb-style exhaust mesh. The build quality of the Corsair HX 650W is generally robust with a professional finish. It's a standard design and has dimensions of 150 x 85 x 150mm and weighs in at 2.271kg, which is pretty heavy for this class of PSU. The manufacturer's stated AC power input is 100-240v 10A 50-60Hz. The Corsair HX 650W ships with a total of 25 output connectors; 1x ATX 20/24-pin connector, 1x EPS/ATX 4/8-pin connector, 4x PCI Express 6/8-pin connectors, 9x SATA connectors, 8x 4-pin peripheral (MOLEX) connectors, and 2x floppy connectors. Despite its strong overall performance, the PSU could further benefit by improving total power efficiency, but it did meet the manufacturer's specifications under load testing with a noise-free result.